About the Book: Marshall is a skeptic when it comes to gingerbread men. He doesn't believe that they will run away. So when the cookies the class decorated disappear, Marshall uses his detective skills to solve the clues and find where the gingerbread men have run off to-and possibly believe in some magic along the way. 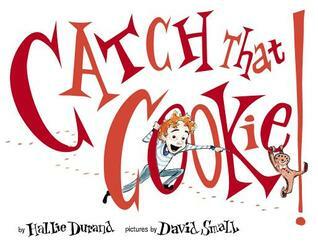 GreenBeanTeenQueen Says: I am always looking for fun holiday books and Catch That Cookie! is one that can easily be added into that category. Marshall is hilarious as he tries to reason why the cookies couldn't have possibly run away with the clues that are left around the school. The clues rhyme and invite kids to shout out the answers as they join Marshall in his gingerbread hunt. David Small's illustrations capture Marshall's curiosity and excitement perfectly. My favorite illustration is the tiny gingerbread men footprints that were left all over the gym. Marshall is determined to solve this mystery! Catch That Cookie! could kick off your own gingerbread man hunt and become a holiday classic. Where would my gingerbread man go? Baby GreenBean has a special gingerbread man this year (since he can't eat cookies, but he can catch them!) Our gingerbread man is made from felt covered with sock monkeys and he's pretty sneaky as he runs all over the tree!